Acoustic consultancy is also part of our range of audio services. Whether you need analysis of a small bedroom studio space or an auditorium we can deliver a comprehensive report to cover all aspects of your room characteristics. Subsequent to this we can provide immediate fixed or stand-alone acoustic treatment solutions, based on our measurements, using our own custom built absorbers, our preferred ’Real Traps’ acoustic treatment products, any other brand of desired products and/or a tailored combination of both. Analysis of problems in your current room. Advice and implementation of acoustic treatment for your studio. Measurement and correction of amplifier and speaker systems. Consultation and planning for new studio projects. Using a DRA Laboratories MLSSA analyser, the results can be focussed on any areas from purely speech intelligibility in reverberant spaces to detailed reports on EQ contours and reflections in recording studio environments. Any further work, such as acoustic treatment or speaker voicing, would be negotiated separately as the level of work needed to make corrections to room anomalies or monitors can vary. 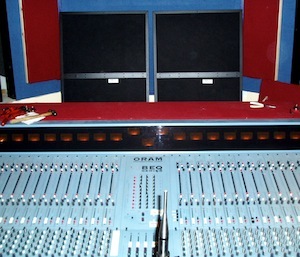 Take a look at our past and present acoustic projects in the Client section and information in our Installation section for help on integrating new equipment into your studio.